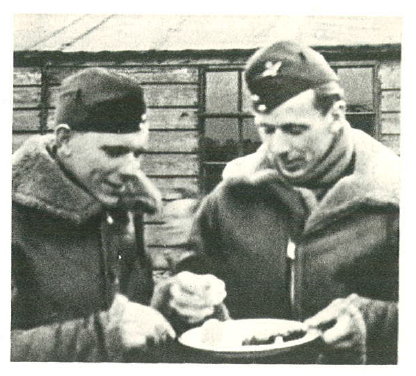 Commanders of unit A and B of Squadron 302, Captains Tadeusz Czerwiński and Julian Kowalski sharing a traditional Easter egg, Kenley Airport 1941. The first spring daffodils smell just as in faraway Poland. 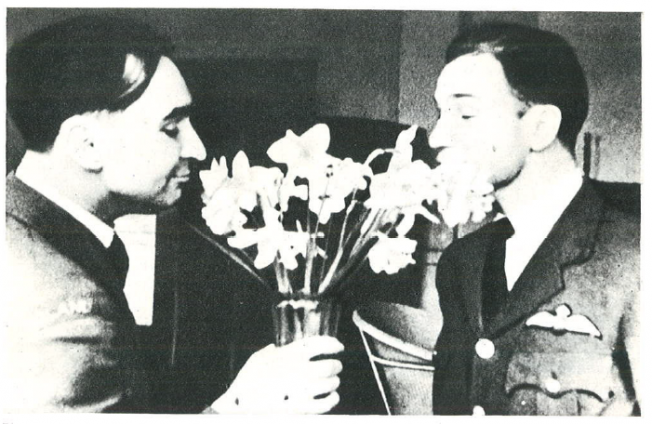 From the right - Lieutenant R.Narucki and Lieutenant W. Król., RAF Kenley, April 1941. 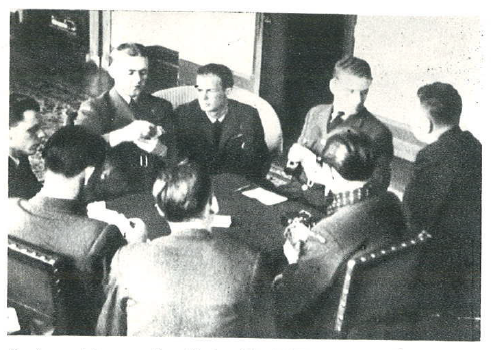 The game of rummy, officers' mess at RAF Kenley. From the left: Captain Julian Kowalski, Lieutenants Wacław Król and Stanisław Łapka, from behind Marceli Neyder, Jan Wydrowski, Zbigniew Wróblewski, an Englishman Paul Harding, Major Piotr Łaguna. The day off. 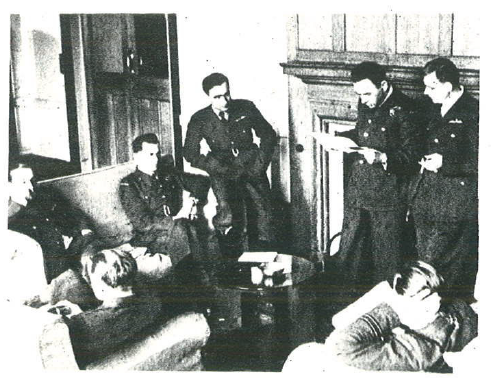 Pilots of Squadron 302 in the officers' mess at RAF Kenley, March 1941. 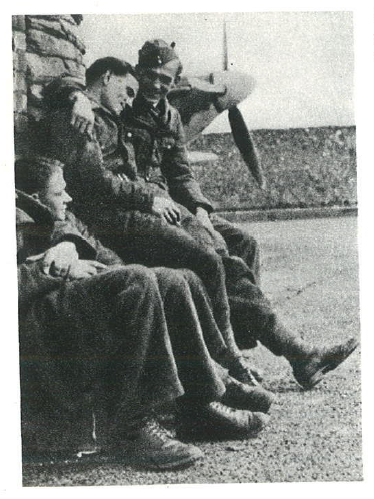 From the right: Captains Julian Kowalski and Tadeusz Czerwiński - Units A and B Commanders, Adjutant Captain Łukaszewicz, Officers Wacław Król and Stanisław Chałupa, from behind Stanisław Łapka, sleeping Zbigniew Wróblewski. A moment of rest for the sky knights fellowship. Horses and armor ready for boarding - RAF Kenley, April 1941. The visit of the artist, Mila Kamińska, at Squadron 302. 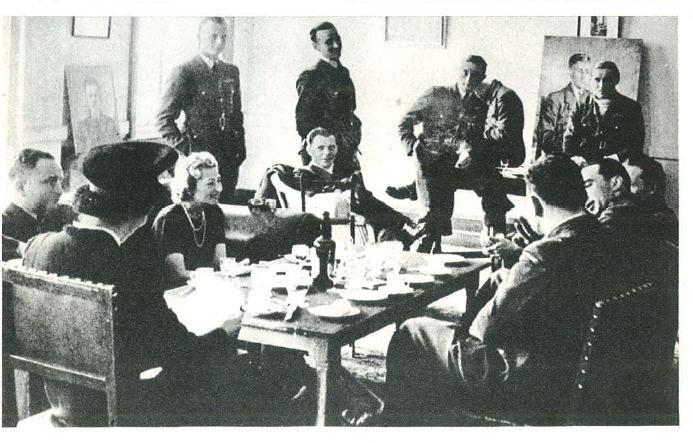 Officer’s mess at RAF Kenley, spring of 1941. From the left: Commander of Squadron 302, Major Piotr Łaguna, Mila Kamińska, Officer Marceli Neyder, Captain Julian Kowalski, Officers: Zygmunt Kinel, Czesław Główczyński, Zbigniew Wróblewski, Captain Tadeusz Czerwiński, Officer Wacław Król and Adjutant Captain Łukaszewicz. The worst is behind us, the invasion failed. One can slack and warm up a bit in the May sun. 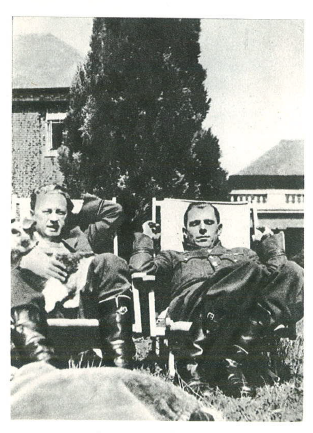 Captain Julian Kowalski (on the right), commander of A unit of Squadron 302 and officer Jan Jokiel in front of the officers' casino at RAF Kenley, May 1941. 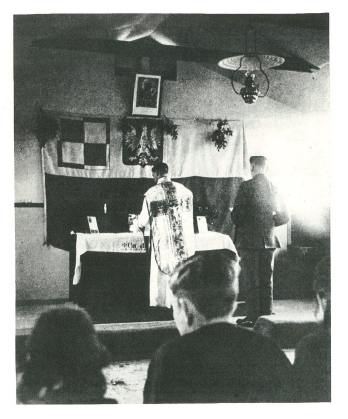 Easter mass in dispersal hut of Squadron 302, RAF Kenley 1941. Sergeant Zygmunt Karpiński is serving in the mass.